We provide a safe, caring, stimulating environment to children and families within a diverse community. We focus on striving to ensure all pupils achieve their potential. Children are valued for their individuality and are supported to overcome any barriers to learning through a dedicated team of teachers and support staff providing appropriate interventions and strategies in partnership with parents. Staff are committed to maintaining high standards to support children with a range of complex needs. The purposeful and happy working environment results in children being enthusiastic about their learning. It is our policy to identify and start to meet the needs of any child as early as possible. This maybe a physical, emotional and behavioural, communication and interaction or learning need. We recognise that parents hold key information about their child and are able to contribute to the shared view of a child’s needs. We keep all parents fully informed and invite them to play an active part in their child’s education. We work closely with the various other support agencies including Educational Psychology Service. The SEND policy complies with the statutory requirements laid out in the SEND Code of Practice 0-25 (2014). The person responsible for managing the schools provision for pupils with SEN is Deniz Oguz, the SENCo who is undertaking the NASENCO accreditation. To view the rest of the SEND policy download the PDF here. To view the Parent SEND Information Report download the PDF here. 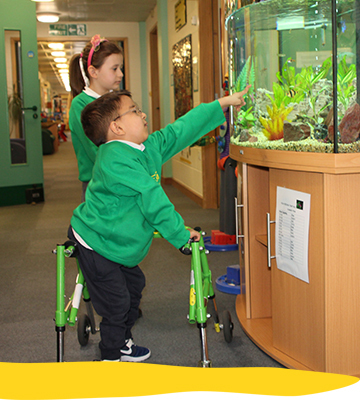 Throughout the school, pupils with learning difficulties and/or disabilities make exceptionally good progress.